The article was first published in News from the Alps – Number 19 Summer 1998/99. Pst… I want to share a secret with you. It’s called the Australian Alps Walking Track. It extends from Namadgi National Park near Canberra all the way to Walhalla in Victoria, some 650 km of the most spectacular mountain country in Australia. I discovered the secret in John Siseman guidebook and was inspired to try it solo! Before you dismiss me as a fanatic I should emphasise that my previous longest bushwalk was 7 days and my previous longest solo walk was 2 days. I am an average bushwalker with some Tasmanian and NZ experience (20 years ago). My message is that this walk is accessible to many people either in sections or as a “through walk”. My planning was detailed. I studied available information about the terrain and water availability. I planned a 32 day walk with two food drops. This meant an average of around 20km per day in some very steep country. I spent a lot of time trying to minimise pack weight. I read a lot and opted for a light Cosmos tent, a minimum of clothing and food and a MSR stove … not as extreme as some American walkers who don’t take tents or stoves, eat mostly Snickers and walk in running shoes! With the drought lingering I decided to leave the walk until autumn. Not too early as water was scarce, but not too late, as bad weather including possible snow would mean a trip of different character. My schedule was based on some formulas for walking based on 4km per hour with adjustments for ascent, descent and track/no track. My schedule was slightly optimistic, after all I am 51 years old and my pack was between 20 and 25kg. I allowed for some easier days but did not allow for bad weather delays. I told family I would like to do the trip, and after they had recovered from the shock, we all started to assume I would do the trip. I received a lot of encouragement from them and other people. My retrenchment in March made it all possible. There was no longer an “excuse” not to do the walk. So on 1st April 1998 (an appropriate start date for such a venture) I emerged from the car at Namadgi Visitor Centre to start the adventure. After the mandatory photo taken by my wife Robyn, I set off into the cool morning air to climb Mt Tennant the first of some 40 peaks that I was to traverse on the walk. Immediately I wondered whether I could sustain the enthusiasm needed for the sheer physical demands. I was also considering the mental prospect of being alone for a month. Did I make the correct decisions about food and equipment? It was all ahead of me to experience and I decided to make the most of it. After all, it is a great challenge. The little wooden markers with the blue logo or the (older) yellow diamonds were to become my trusty guides for the next month. Don’t be deceived, this is not a walking footpath. It is a route with occasional strategic markers to keep you from straying. Many times you need map and compass to confirm your route. The markers are an aid but you need maps and the guidebook to follow the track. Passing through nature reserves, national parks and state forests, the Australian Alps Walking Track is a result of cooperation between several authorities. It is there as a linkage of fire trails, walking tracks and navigable routes that join to form a track. It varies in standard from fire trail to shoulder high scrub. It rates amongst the best of the world’s extended walking tracks. Firstly, since it is a well kept secret it is not crowded. This was a surprise to me as I expected to meet other walkers doing the South to North traverse. Actually I did not meet any other party doing the entire walk. I kept expecting to arrive at well-known campsites to see a friendly campfire but it did not happen. I would walk for periods of five or six days without seeing any other person. A true solitary experience. There was plenty of time to be alone with my thoughts and to absorb the experience. Next, it is spectacular. I was amazed at the wondrous scenery and it was impressed on me that I was an insignificant being in such an incredible wilderness. Nature is big and we are small, to survive close to nature we need to accept and adapt to nature’s timetable. The remoteness was also impressive. The track does cross roads but in general they are minor and I can remember only two bitumen roads crossed. Next, it is undeveloped. By this I mean there are very few facilities. This is both an advantage (as it discourages the crowd) and a disadvantage in that some basic improvements could improve the experience. I quickly established a routine. My tent pitching, cooking and hygiene tasks became second nature as a basic set of chores that can not be avoided. Walking was done to maximise the use of daylight (7am to 6pm at this time of year). Rest and sleep occupied the dark hours (no sitting around the campfire). 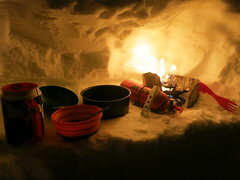 My strategy for any bad weather encountered was to take a conservative approach and pitch the tent and get in the sleeping bag if there was any risk of hypothermia. I carried two litres of water (in summer, walkers carry more than five litres). I had a diet and lifestyle that was similar to much of the world’s population- a bowl of carbohydrate (spaghetti, rice or couscous) for my main meal and high physical exertion from dawn to dusk each day. My body assimilated this change of diet and workload surprisingly well although I did lose 10kg during the walk and looked a bit like a starving refugee at the end (I needed to take more Mars Bars!). My fitness improved as each day brought its share of 400 metre climbs. The daily challenge to keep to a schedule kept me fully occupied physically and mentally. Namadgi to Dead Horse Gap (near Thredbo) 200km completed in nine days, including the traverse of Kosciuszko National Park from Kiandra to Mt Kosciuszko summit. 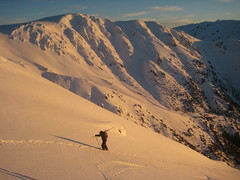 Dead Horse Gap to Mt Hotham, 232km completed in eleven days, including Pilot Wilderness, some steep mountain country east of the Mitta Mitta , climbing Mt Wills, Mt Bogong and a rapid traverse of the Bogong High Plains. Mt Hotham to Walhalla, 235km completed in fourteen days including some of the most spectacular mountain wilderness I have ever encountered in the Viking-Razor-Howitt peaks. The walk finishes at Walhalla after passing through Baw Baw National Park. Brumbies, lyrebirds (as common as chooks), kangaroos, wallabies, emus, and a huge variety of other birds. Meeting other like-minded walkers and sharing the experiences with them. Marvelling at the variation and ruggedness of the country. The historic sites of goldfields and early cattlemen’s huts. Appreciating simple pleasures like mountain air and water. The views from Mt Tate, Mt Speculation, Mt Wills, Mt Bogong and other major mountains traversed (around 40 peaks). Experiencing the Viking-Razor wilderness and learning to appreciate meaningful names like Mt Misery, Terrible Hollow, The Crosscut Saw, Morass Creek and Mt Despair. A generous gift of food from some 4WD travellers, to augment my dwindling supplies. The sight of Walhalla at the end of the walk and the friendly welcome I received there from Norm and Rhonda at the Walhalla Store. A hot shower after 34 days. Hectares of cow poo in the Barry Mountains. Buenba Hut Site, this must be the coldest spot in Victoria, where my Weetbix milk froze in the plate. The “track” up Johnnies Top, a formidable climb. 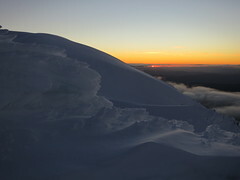 I completed the walk in 34 days after spending two days stranded in the tent in a snowstorm on Mt Speculation. How Could the Australian Alps Walking Track be improved? Some additional campsites could be established along the track and water tanks provided at more locations. I think cattle should be excluded from the Victorian sections as their presence fouls the campsites and streams on part of the track. Track maintenance is also minimal and several sections are overgrown and it can be difficult to pick out the route (partly due to lack of use). For a world class route it is below world class as a track. I understand the dilemma faced by conservationists: whether to discourage use and preserve wilderness as an experience for a few hardy souls or to improve facilities to provide a wilderness experience for more people. In this case I believe the track should be promoted as a world class eco-tourism experience and made accessible to more people as a significant part of Australia’s natural heritage. 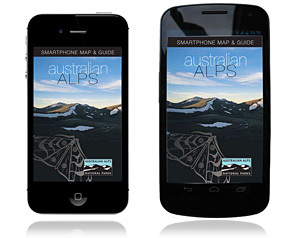 I would recommend the Australian Alps Walking Track to all walkers. It is well worth the effort. See and experience it now for yourself and help to explain it to others. Why not see Australia first? Have heard a rumour that it is planned to extend the AAWT to 3000km. Oh well, it looks like I will have to get the gear out and get started before the secret gets out. The Australian Alps Walking Track by John Siseman 3rd edition, published by Pindari Publications. Rob Horsfield track notes (A report to Canberra Bushwalking Club) of a 52 day trip Walhalla to Namadgi, November 1997 to January 1998, with groups from Stromlo High School doing sections of the walk.